In honor of Memorial Day next Monday we have chosen an object related to the brave men and women who serve our country. Have you ever driven down a street and saw a flag hanging from the window with a blue or gold star on it? These flags are called Service Flags and are an official banner by the Department of Defense. They represent either a family member currently serving in our Armed Forces or one who made the ultimate sacrifice. The Service Flag was started during World War I. Army Captain Robert L. Queisser of the 5th Ohio infantry designed and patented the flag in honor of his two sons fighting on the front lines. The flag has a white center where blue stars could be attached with a red border. Most of the flags were hand made by mothers across the U.S. and the flag rapidly became the unofficial symbol for having a child in the Armed Services. 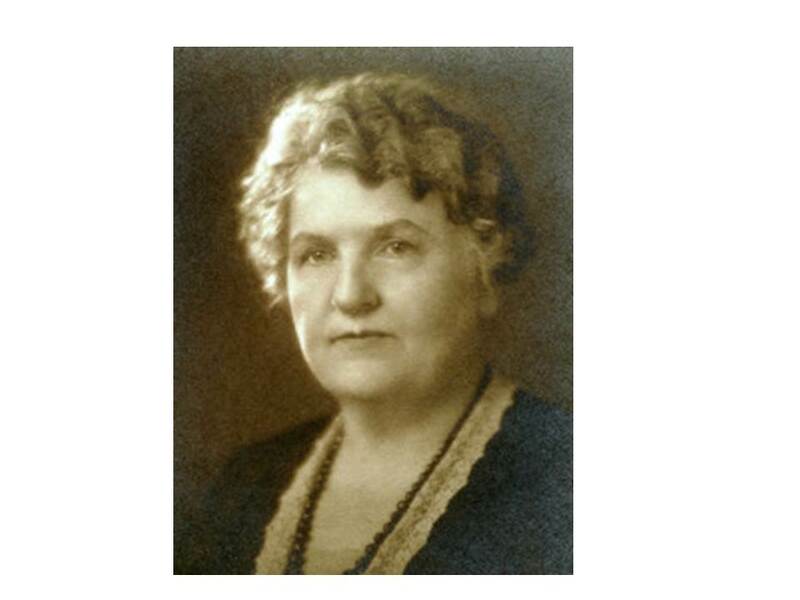 In 1918 President Woodrow Wilson approved a suggestion from the Women’s Committee of the Council of National Defenses for mothers who had lost a child while serving to wear a gold gilt star on the traditional black mourning arm band. The led to a new tradition with the Service Flag; while a blue star indicated someone serving, a gold star meant someone had died while serving our country. A gold star would be placed on top of the blue star being slightly smaller than the original blue star. This way the gold star had a blue border. The color of these stars is also significant. 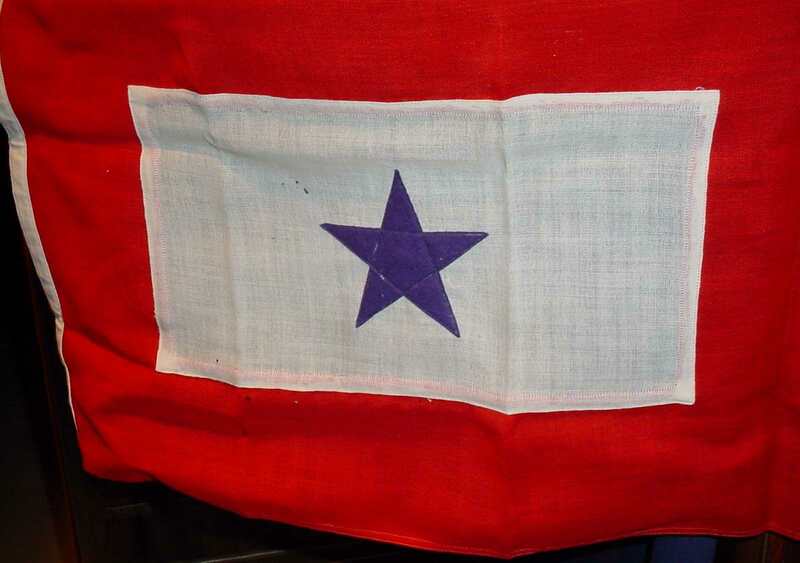 The blue star represents hope and pride with the gold star representing sacrifice to the cause of liberty and freedom. During World War II displaying the Service Flag became more widespread. One of the most famous Service Flags would that of the five Sullivan brothers who were all killed November 13, 1942 when the ship all five brothers were assigned to, the USS Juneau, was sunk. Another instance of family members serving and dying together comes from Pearl Harbor. Less than a year earlier on December 7, 1941 twenty-three sets of brothers and one father and son were killed in the attack on Pearl Harbor. Despite popular belief, there are no laws or regulations against family members serving together, even after these incidents. Warnings are given to family members wanting to serve in a hostile area together but they can still choose to fight together. The mothers of these fallen soldiers would have become members of the American Gold Star Mothers. son George during WWI. Congress chartered the Blue Star Mothers of America as a Veterans Service Organization in 1960. This organization provided care packages for military members serving our country and provided assistance to families on home front. Service Flags were also used during the Korean and Vietnam Wars but not as widely as before. After September 11, 2001 the American Legion brought back this tradition to honor the men and women fighting. A Service Flag is an indoor flag that is hung facing out from the front window of a home or organization. The United States Flag is displayed with the Service Flag but the U.S. Flag should be of equal or greater size and should hang above the Service Flag. It is used only during times of war or hostilities and the Department of Defense specifies that only certain family members are authorized to display the flag. These family members include the wife, husband, mother, father, stepmother, stepfather, parent through adoption, foster parents, children, stepchildren, children through adoption, brothers, sisters, half-brothers and half-sisters. In honor of these brave men and women who sacrificed so much for our country, let’s stop and remember them. Some might remember the fallen at cemeteries with some sort of arrangement. If you visit a graveyard or cemetery you might see poppies placed on the graves of service men or women. Poppies are known as the flower of remembrance. This tradition also comes from WWI when Colonel John McCrae of Canada’s First Brigade Artillery wrote a poem about the rows of soldiers graves covered with this flower. You can read the poem here as well as more information about the poppies. There are many stories of service and bravery in our community. The High Plains Museum collects these stories and would love to have your story. If you do not feel like sharing with us, think about recording your own family history and sharing it with your family. To read a serviceman’s story from Goodland click here. It takes an extraordinary amount of courage to fight for our country and our freedoms, so in honor of Memorial Day May 27th let’s honor and remember them. We would like to honor, remember and thank all the veterans who have served our country this Memorial Day and every day. Thank you.